Before we talk more about diversity, one thing we should be clear on is that we’re not talking about signal combining. Signal combing is commonly used when you need to receive signals from different directions. For example, here in the San Francisco Bay Area the main transmitters are located atop Sutro Tower in San Francisco. However, particularly for those in the South Bay, some channels are better received from transmitters located on Mt. Allison and Monument Peak in the hills above Fremont. If you have an omnidirectional antenna, you might be able to receive all of these. However omnidirectional antennas tend to be prone to multipath, which is a major problem in the SF Bay Area. So using two directional antennas generally yields better results. The problem with using two antennas, of course, is that you end up with two RF cables. Aside from all the extra wiring associated with running the two signals around your house, it’s unlikely that your TV or set-top boxes will accept two RF inputs. So you’d really like to get down to one RF cable. In order to merge the signals from the two antennas you can’t just splice the cables together. Even though an antenna is pointed away from a tower, it will pick up some of its signal (along with some general noise). If you were to splice the two RF cables, you’d be adding that weakened and in all likelihood out of phase signal to the good signal from the antenna that is pointed towards the tower. Instead, you need to filter the signal so that each antenna supplies only the channels it’s intended to receive. So for the antenna pointed at Sutro Tower you would filter out all the signals from Fremont, and vice-versa. Then the filtered signal from each can be fed into an RF combiner. With RF signal combining you eventually end up with one RF cable coming out of the combiner. 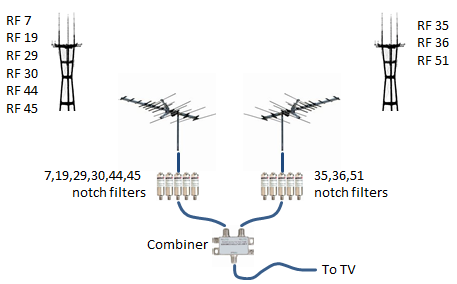 This is a particularly good solution when all of your favorite channels can be received well, but you need multiple antennas pointed in different directions. With RF signal combining, you end up with one version of a signal for a particular channel. In contrast, diversity relies on processing more than one version of a received signal. The idea is that each received signal is different in some way, and when one is impaired one of the others may not be. By switching among the various versions, a receiver can patch together a hybrid signal that is better than any of the individual ones. So diversity can help both when you have a good signal – there will always be the occasional transient impairment – but shines when applied to signals that are more difficult to receive. …multiple antennas offer a receiver several observations of the same signal. Each antenna will experience a different interference environment. Thus, if one antenna is experiencing a deep fade, it is likely that another has a sufficient signal. Utilizing diversity to improve your TV experience is particularly useful if the impairments are dynamic. For example, you may be affected by reflected signals from passing cars or planes. Wind blowing through the trees may scatter the signal, and the occasional roof-wandering cat may cause its own set of problems. As long as you can receive one signal that is immune to the impairment, then the hybrid signal will be unimpaired. While we’ve so far talked about having one version of the signal that’s unimpaired, diversity can also be used to recover a signal when all of the signals are impaired – as long as they’re impaired in different ways. In this case the receiver needs to employ more sophisticated algorithms to recover the signal. For example, it could use properties it obtains from one or more signals as hints about how to interpret another signal. For a concrete example of antenna diversity’s effectiveness, we can consider the situation with KKPX-DT here at Koherence HQ. We have three attic mounted antennas, and in late spring/early summer, the “prime” antenna for receiving KKPX-DT slowly migrates from one antenna to another antenna. Both antennas are oriented towards the KKPX-DT transmitter. However they are of different models, physically spaced about six feet apart, and their orientations are offset by a few degrees. The difference in signal reception is pronounced. Over the space of an hour or so, the signal from one antenna goes from pristine to exceptionally bad (near constant blocking). Over that same period, the signal at the other antenna goes from marginal (blocking every couple minutes) to near pristine. When we first considered this condition we thought that we might get a good hybrid signal at the beginning and end of the transition period. But since both antennas were receiving a marginally watchable signal in the middle we didn’t hold out much hope of improving that portion. To our surprise, the hybrid signal was near error-free throughout the entire transition! In the middle of the transition the hybrid was created by constantly switching between the two signals. While both were significantly impaired, they tended to be impaired at different times. Different models of antennas. At present there are three models – a ChannelMaster CM4228-HD pointed at Sutro Tower, a ChannelMaster CM4224-HD pointed a few degrees off of Sutro Tower, and an Antennas Direct DB4e pointed towards Fremont (between Mt. Allison and Monument Peak). Antennas differ in how directional they are, and also in their gain at specific frequencies. Antenna Hacks is a good source of information on various antennas. Different orientations. As mentioned the CM4224-HD is actually offset slightly from Sutro Tower by a few degrees. This was deliberately done so that multipath reflections would have a possibility of affecting the CM4224-HD and CM4228-HD to different extents at different times, in the hope that one or the other would be unimpaired (or unimpaired enough) at all times. And yes, the CM4228-HD is used to grab signals from Fremont even though it’s pointed about 90 degrees away. Different tuner/demodulators. Different models of HDHomeruns appear to handle impairments in different ways. The latest generation HDHR5s tend to be superior across the board, but there are cases where an HDHR (1st gen with DRXj demodulator) would successfully demodulate a portion of the signal that the HDHR4 (Panasonic demodulator) would not. There are a great many ways that an RF signal can be impaired, so it’s not at all surprising that a particular demodulator might excel at handling some impairments while doing a more mediocre job at others. Receiving signals from multiple towers. In some instances, a station may broadcast from multiple locations. For example, KGO TV broadcasts from both Sutro Tower in San Francisco and a translator atop Mt. Allison. The latter is intended to serve the South San Francisco Bay Area. Because the towers are so far apart, there’s a good chance that something impairing one signal won’t affect the other. A word of caution is in order, however: not all translated broadcasts are bit-for-bit identical with the primary broadcast. They also tend to be offset in time – the translated broadcast may be seconds delayed from the primary broadcast. This was in fact the case with the two KGO broadcasts in 2017. They were close enough that they could be used to create a hybrid stream, although the differences in time and bit structure complicated the process of figuring out which parts of the signals corresponded with each other. Antennas that are located a short distance away from each other. The CM4224-HD and CM4228-HD are about six feet away from each other. This may seem a bit odd, and indeed we’re treading into the domain of RF magic rather than RF science. It’s a well-known phenomenon that, for no apparent reason, moving an antenna by a few feet can greatly change how well an antenna performs. That same principal appears to apply in creating diversity. One can apply diversity at any point where you can figure out which signal is better. In theory this could be done very early in the demodulation process, for example by characterizing the eye pattern for each RF input. This has the advantage of minimizing redundant hardware – and demodulators can be rather expensive in terms of silicon space and power. The switch point could also be done within the demodulator right after the Reed-Solomon coding step. Reed-Solomon coding lets the demodulator know if a particular packet has errors or not. So it’s an ideal point to check if packets from other inputs don’t have errors. In Project Entangle, we gain access to the signal after it’s been fully demodulated – i.e. once the transport stream has been recovered. The transport streams from multiple HDHomeruns (fed by various antennas and the HDHomeruns themselves being of varying vintages) are analyzed to produce a hybrid transport stream. A downside to analyzing the transport streams at this stage is that we lose signal timing. Although the MPEG transport stream carries compressed audio and video, there are a surprising number of identical transport packets that can occur in a short period. This needs to be accounted for when aligning the transport streams from multiple sources to avoid false alignments – something made all the more difficult since one or more of the streams may be damaged. So Just How Well Does it Work? To give you an idea of how well diversity can aid in restoring broadcasts, let’s look at a broadcast from KNTV-DT during an episode of severe weather. The KNTV-DT transmitter is located atop San Bruno Mountain, which from Koherence’s location is five degrees east of San Francisco’s Sutro Tower. Two versions of the broadcast were acquired: one using a CM4228-HD antenna oriented towards Sutro Tower (the “main” antenna), and a second using a CM4224-HD antenna oriented a few degrees off of Sutro Tower (the “alternate” antenna). A number of properties were used to align the transport streams obtained from each antenna. The streams were then segmented into slices of approximately 40 milliseconds. A quality metric was applied to each set of corresponding segments, and the “best” segment from each set was used to assemble a hybrid transport stream. The image below visually depicts the quality of three transport streams corresponding to the KNTV-DT broadcast. Each line represents ten seconds of transport stream, with its color indicating the number of errored or missing packets in those ten seconds. While there isn’t a strict relationship between the number of missing or errored packets – particularly over a ten second period – yellow tends to indicate that noticeable glitching occurs, but the broadcast is in general watchable. As the color moves towards the orange and red side of the scale glitching becomes excessive to the point that the broadcast is unwatchable. Shades of green represent slight errors that are likely handled by error concealment, or result in slight noise that may often go unnoticed. The left side of the image titled “Main” represents the transport stream as received by the CM4228-HD main antenna. The right portion titled “Alt” represents the transport stream as received by a CM4224-HD alternate antenna. The middle portion, titled, “Merged”, is the result of cherry-picking pieces of the Main and Alt transport streams to create a superior hybrid transport stream. The Main broadcast in this case has portions which are rather heavily impaired. While watchable the artifacts detract significantly from the viewing experience. The Alternate broadcast is even more heavily damaged. Yet, by using portions of the Alternate broadcast to supplement the Main broadcast, a significantly improved hybrid stream is obtained. The hybrid stream is not without errors, and significant block noise is noticeable in five or six instances. However the viewing experience is considerably better than the Main broadcast. This example employed antenna diversity with two different models of antennas. It’s likely that even better results could have been obtained by using additional forms of diversity.